The pretty Monarch Butterfly is well known and easily recognized in this part of the country, as they spend the summer here. 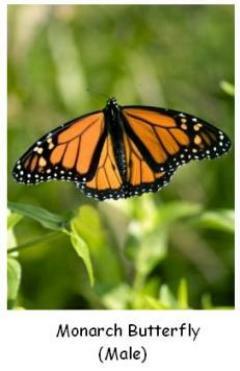 Sometimes known as the Milkweed Butterfly, this is probably the best known butterfly in North America. 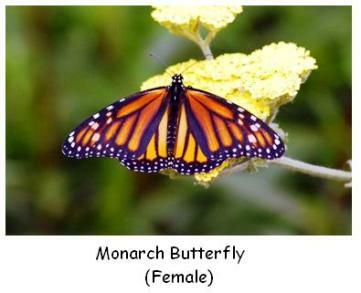 Female Monarch Butterflies have darker veins on their wings than the males, which can help identify them. In addition, the males have a spot, called the androconium, on each hind wing, which secretes pheromones which makes them irresistible to females! After attracting a female and mating, the female lays her cream coloured eggs on the Milkweed plant, from which the striped caterpillars grow and hatch. During their time as caterpillars, these little creatures eat only the Milkweed plant, which has a bitter taste. This bitter taste is passed along to the caterpillars and makes them unpalatable to predators, which avoid them. 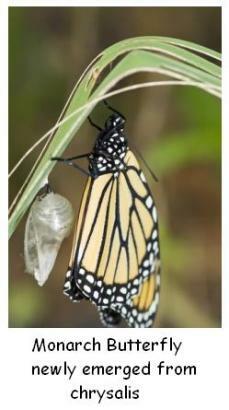 When changing from caterpillar to butterfly, the blue-ish green chrysalis waits until the butterfly is ready to emerge and when ready, the butterfly escapes from its chrysalis, waits until its wings are dry, then flies away. In this area these insects make their southward migration at the end of the summer, when they fly from Southern Ontario to their wintering grounds in Mexico. The female Monarch Butterflies lay the eggs for the next generation during these migrations and no one individual makes the whole trip. They also migrate north in the spring, however, because of their short life-span, each individual makes only part of this long journey, as each creature only lives for about two weeks. Although we know a lot about the life-cycle of this butterfly, experts still do not know how these tiny insects pass along the knowledge of their migration routes to the next generation - I guess their instinct guides them. This butterfly is unique among North American butterflies in performing an annual two-way migration in vast numbers from one area of the continent to another, learn all about "les papillons"